the star attractions leading all the wise men to your festive table. “Happiness, Simple as a glass of chocolate or tortuous as the heart, Bitter. Sweet. Alive.” - Joanne Harris, Chocolat. Don't invite the usual suspects, be brave and invite someone new; who'll breath new life into old conversations. I also like having someone outspoken and controversial at my table, even boring politics and religion lets everyone sit up straight! Place settings give you the upper hand so do separate old foes and boring couples. Even Stalin in his madness realised these are commodities the world needed while his countrymen were starving. Why Marie Antoinette said "give them cake" we'll never know, she really gave confectionary a bad name. For me these words spell, Holiday, Christmas, summer, bliss, pleasure, indulgence and opulence. A well planned, well executed menu would shine the spotlight on your table and leave your guests satisfied and mystified by your brilliance. The beauty of the recipes I share are that they can be prepared in advance. 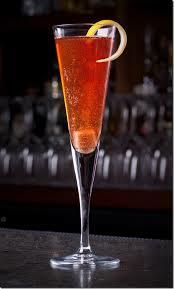 Serving bubbly or sophisticated Sparkling Red Cocktail when guests arrive adds a glamorous sparkle to the evening. 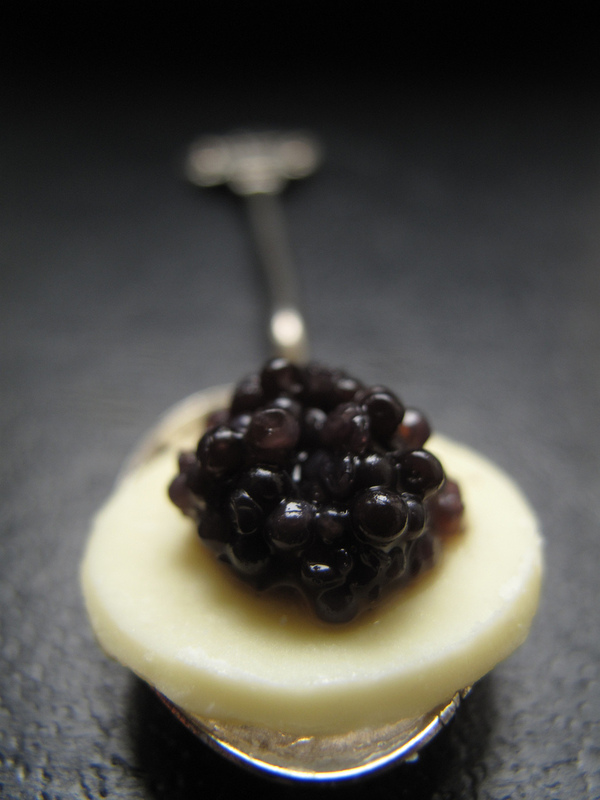 Just a sprinkling of caviar or fish roe as a garnish or, a generous dollop on Blinis with sour cream served as canapés or as a starter shows panache. The Chocolate Timbales (Fondants) can be made well in advance, and kept in the freezer; just 8 minutes before serving whip them out, pop them into the oven and Voilà you have a spectacular dessert! Garnish with the Tuille biscuits and a scoop of ice-cream. When the accolades have died down swoop in with a beautiful Cambrieni and Mixed berry compote and homemade Almond bread. All the competition will groan and as a final piece de resistance move in with a perfectly brewed French coffee (Brandy) and Chocolate Rum Truffles. Golden rule: Guests always remember the Starter and the Dessert so blow them out of the water with those courses, they're the least complicated and with a little effort can be glamorous, fun and creative. Add goldleaf, candles, flowers and herbs to make them sparkle. Remember K.I.S.S. and keep it simple. Concentrate on freshest seasonal ingredients. Place some crushed ice-cubes, a slice of lemon and some lemon juice in each flute. 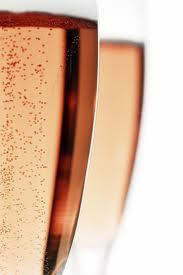 Add a dash of Crème de Cassis and top with soda water or Sparkling wine. For an informal affair serve the cocktail in a large glass bowl or be frivolous and serve the drinks in jars, festively decorated with a sprig of mint or a lavender flower. A Large bowl of freshest Strawberries on the side compliments the Sparkling wine and the Red Sparkling Cocktail. Who's up for Boules you may well ask! A silver salver piled high with shucked oysters and caviar on crushed ice would be the ultimate treat. Prepare batter 3 days in advance, cover with cling film and refrigerate until needed. 45 minutes before guests arrive make the blinis and serve at room temperature. You can also serve blini topped with a slice of smoked salmon neatly rolled, garnished with a dollop of thick Crème Fraiche and a garnish of caviar or a sprig of fennel. 5. 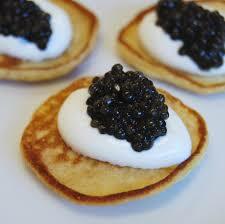 Serve blini topped with sour cream and caviar. 7. To serve as an individual starter; plate and serve with a small herb and lettuce salad dressed with a citrus dressing. 1 part olive oil, ½ quantity lemon and vinegar, a teaspoon honey, salt and pepper, grated citrus peel and chopped fennel or snipped chives. 8. Prepare your plates, platters or trays an hour before your guests arrive, cover with cling film. The small salads will improve with flavour at room temperature, dress after the main filler has been added, just before serving. Batter can be made 3 days ahead and chilled, covered (after letting it rise in a warm place). If necessary, thin batter with a few teaspoons of milk before using. NB This recipe must be prepared at least one day before serving. Beat eggs, egg yolks and sugar to a sabayon (thick and creamy), slowly add chocolate mixture and mix until smooth. Fold in the flour, and pour into well-buttered moulds. Chill overnight. Cool slightly before turning out. TRY: an additional square of chocolate pressed into the middle of the filled mould adds another yummy dimension to this dessert. • DO NOT OVERCOOK THESE TIMBALES a runny centre is imperative. 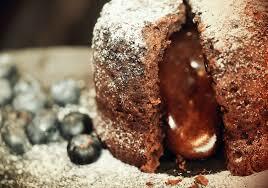 • The filled moulds may be frozen and baked straight from the refrigerator, which makes it an ideal holiday surprise. 3. Then mix in the flour to form a smooth paste. 4. Chill for 2 hours. 6. Biscuits can be wrapped around a lightly greased rolling pin or bottle as soon as they come out of the oven, work very quickly as the cool down and will break. Slide off the rolling pin as soon as they’ve hardened. If you’re adventurous and would like to try this just make 2 Tuille on a baking sheet at a time. 7. Keep in an airtight container until needed. Line a loaf tin with parchment paper. Beat egg whites until stiff, add sugar and beat well. Fold in the sifted flour, almonds and essence. Pour into prepared tin and bake in a pre-heated oven at 180°C for 30 minutes. Cool and refrigerate. Slice into paper-thin slices and bake in pre-heated oven at 180°C until golden, about 5 minutes. Boil together for 2 minutes. Add berried to the syrup, simmer for a few minutes and pour over the Cambrieni. 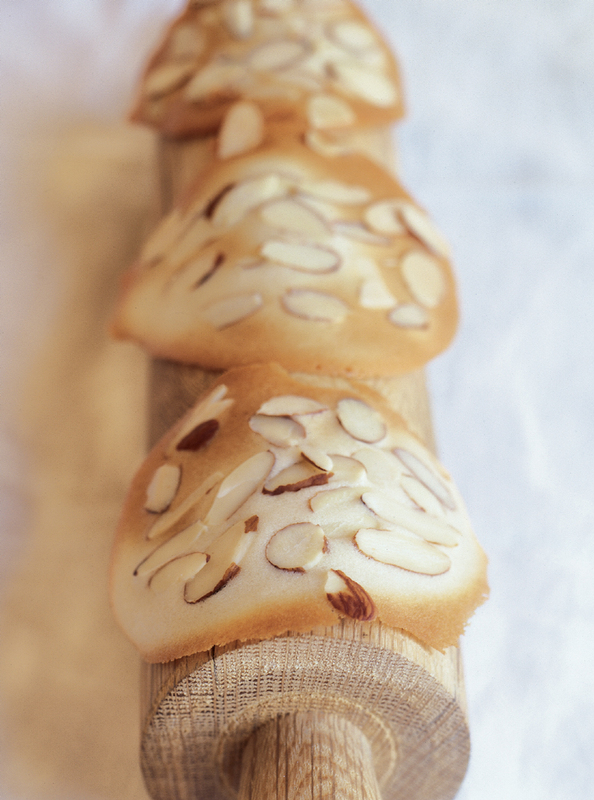 Serve with almond bread. 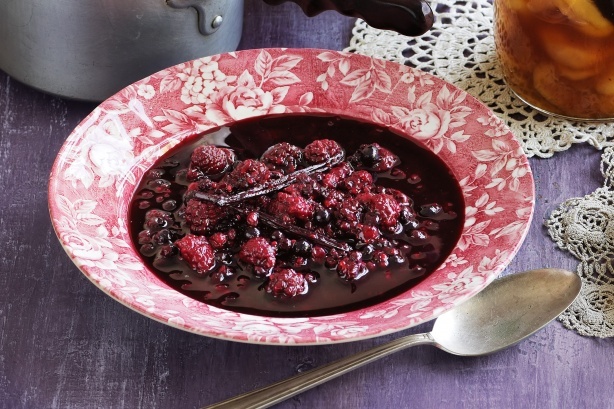 This Berry Compote is versatile and may be used as a sauce with ice-cream, with pancakes or joghurt. 2 Star Anise pods give comfort when it's cold. 1. Crush the biscuits into fine crumbs. Combine biscuit crumbs, rum, cocoa, icing sugar and nuts in a bowl. Pour in the melted butter, mix well. 4. Chop one third of extra chocolate roughly, put into the top of the double boiler, and stir over simmering water until melted. Remove from heat, pour into a bowl, add one third of the coconut, mix. Roll each ball in the melted chocolate mixture. 5. Place on a tray, refrigerate until truffles have set. Repeat with remaining balls and extra chocolate and coconut. 6. 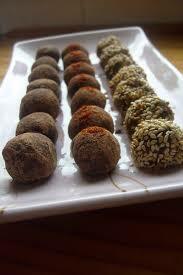 Truffles may be dusted with extra cocoa powder, icing sugar or add finely chopped nuts instead of using coconut. A Marachino cherry may also be inserted into the centre of the truffle before rolling. Keep truffles in an airtight container and serve as needed. Remember: guests feel most comfortable and relaxed when the hostess is organised, plan your menu ahead of time, buy ingredients and make as many dishes beforehand, lay the table a day before the party, make a list and tick off everything as it's done. Stack crockery to be used within easy reach and do garnishings beforehand. Let friends remove plates after each course and pack the dishwasher. Enjoy your own party by being dressed 30 minutes before guests arrive, wear your favourite red lipstick and sizzle with a glass of bubbly as the front door opens. 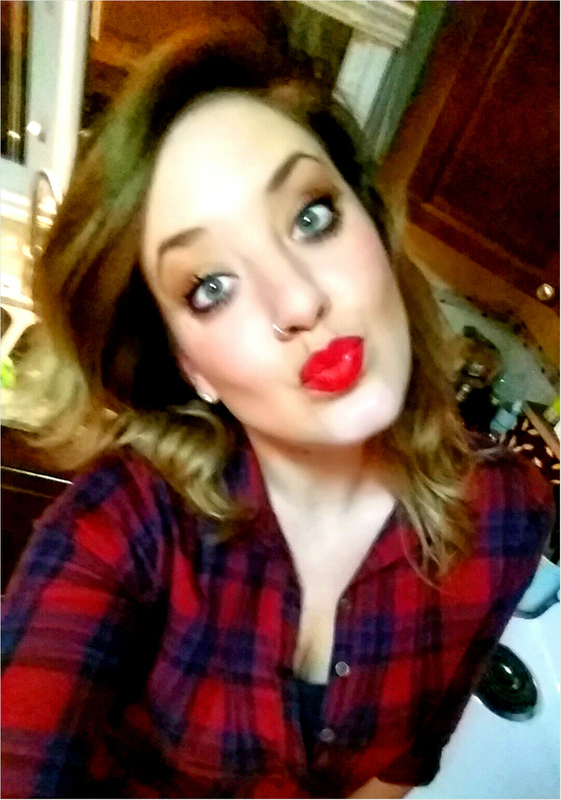 Take a deep breath, re-apply the red to the lips, relax and now; knock their socks off! Let your partner in crime be in charge of the main course, let them bask in your reflected glory too.